Habitat for Humanity International (HFH) is a nonprofit, ecumenical Christian organization dedicated to eliminating substandard housing and homelessness worldwide and to making adequate, affordable shelter a matter of conscience and action. Habitat is founded on the conviction that every man, woman and child should have a simple, decent, affordable place to live in dignity and safety. HFH fulfills this mission by building simple, affordable housing for those who could not otherwise afford their own home. Houses are built largely with volunteer labor and the homeowner is given a no‐interest mortgage to help keep the homes affordable. Homeowners are also expected to contribute “sweat equity” toward the building of their own house as well as those of others. To date HFH has built over 200,000 houses around the world. For more information visit the Habitat for Humanity International and Habitat for Humanity‐Cincinnati web sites. Construction: Whether or not you have particular construction skills, come help build the house. There is plenty to do for both skilled and non‐skilled volunteers. Morning Greeter: Welcome volunteers to the job site in the morning and help to get everyone signed in. Provide Coffee/Donuts: Help to get the volunteer crew off to a good start in the morning with coffee and donuts. Donate New or Used Building Materials: HFH uses only new building material on their new construction houses. Occasionally HFH will rehab an older home and will selectively use used materials to match existing features of the house. Surplus new and used materials are also sold through HFH’s store in Hamilton. Proceeds from the store are used to help fund HFH. Contact Jack Barter for a list of new building materials that HFH needs. Office work: Volunteer at HFH’s central office. 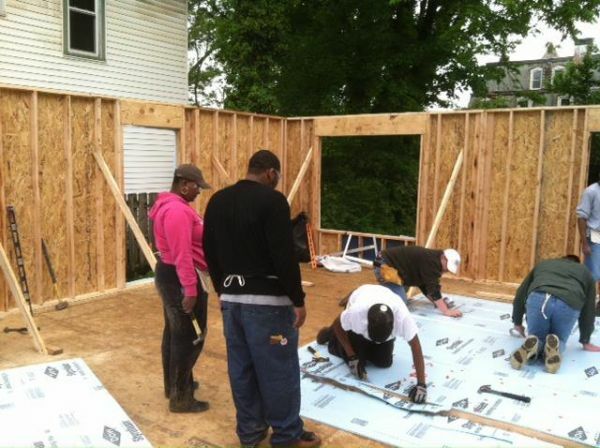 Publicity: Take pictures of the house and the volunteers at work. Help keep the parish informed about progress and future volunteer opportunities. In addition there are numerous volunteer positions available on the HFH Project Steering Committee including Site Coordinators, Volunteer Coordinators, and Family Advocates. Contact Ed Polaski for further details.